Almost every player looks for a strategy that can give him or her edge over the house. Many players hear about or stumble on a surefire system. The system includes doubling the bets following every loss. They make out that eventually they will win. The name of this system is Martingale system. This system also has the credit of ruining many players. In this system, you place a wager. Moreover, if you lose the bet will be doubled. In case you lose again, the bet will be doubled again and continue until you win. For instance, assume that you playing blackjack on a table with minimum bet of five dollars. 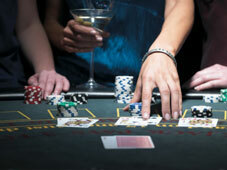 Most of the casinos have maximum bets. The highest bet for five-dollar tables is mostly 500 dollars. If you employ the martingale strategy, you will bet five dollars and if you are defeated, the following bet will be ten dollars and so on. In almost eight losses, you will exceed the maximum bet of that table. Regardless of how many times the bet is doubled you will win only five dollars even if you hit eventually. All your progressions are taken into account. It is hard to imagine risking so much money on a win of just five dollars. Some people have initial success with the Martingale system but ultimately they will discover that there is a flow in this system. To use this system a player has to place even bets. Among the most admired bets those who use this scheme is to place their bet on the red or black onto the roulette wheel. If you think that you will not lose 7 bets continuously then you should take a walk all through a casino and go through the display board showing 20 previous spins. Check the number of times one color crop up more consecutively. If black appears seventeen times and you began with a 5-dollar bet then your 17th wager will be $327,680 according to this system.